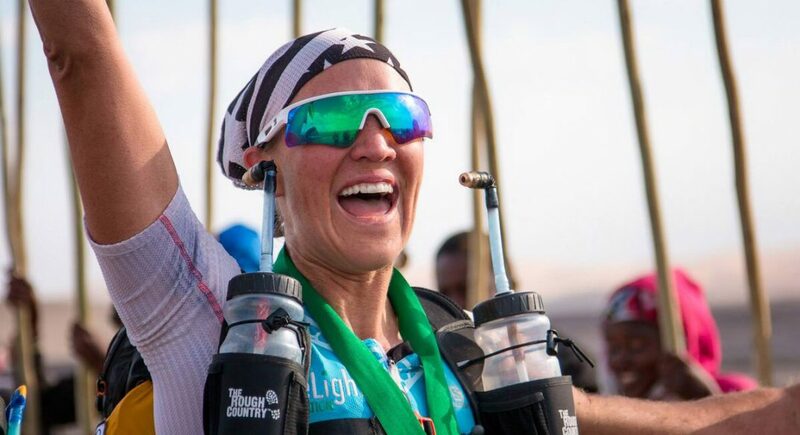 Mariash celebrates her victory after the Sahara crossing in Namibia. Photo by Scott Manthey. 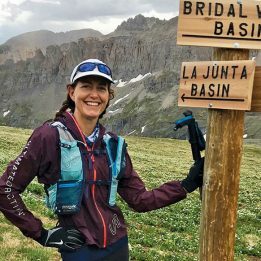 This year Jax Mariash, 36, of Hood River, Oregon became the first woman to complete the Four Desert Race Series Grand Slam Plus. 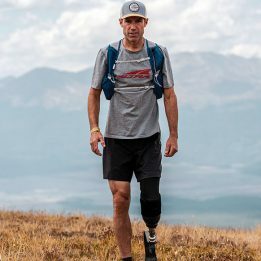 The 4 Desert Race Series is a series of four 155-mile stage races that take place over the course of a year through some of the world’s most remote and foreboding landscapes—Namibia’s Sahara Desert, China’s Gobi Desert, Chile’s Atacama Desert and “The Last Desert” in Antarctica. The courses are rugged and self-supported: runners must carry everything they’ll need to survive on their backs, except hot and cold water, medical supplies and a tent space to share with nine other racers, which are supplied by the race directors. Mariash, who also runs her own marketing company and an upscale coffee/roasting shop in Hood River, Oregon, made history in the series as the second woman ever to secure a first place finish in all of the traditional 4 Desert Races and the first woman to complete a Grad Slam Plus. The Grand Slam Plus adds a fifth roving race- this year in Sri Lanka- where Mariash finished in second place. These combined performances earned her the title of 2016 4 Deserts Female World Champion. Somehow, Mariash still had enough energy to answer a few questions for Trail Runner about how she was able to train, travel around the world and manage her businesses. A typical day starts at 4:30 a.m. with a huge cup of STOKED coffee. I work until it is light and then usually go out on my first run. Then I am back to working again, usually in my running clothes still. Later, I will go for another small run or just put all of my focus on recovery with a massage or a short nap. Then I work until 10 p.m. and pass out. In between I sneak in snacks and meals, typically on the run. How did you train for the series? I trained 45-100 miles a week. 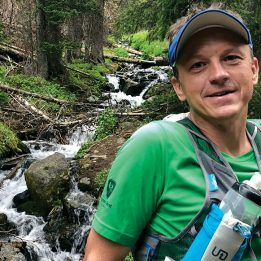 Each week would include one or two runs with a pack loaded with the actual gear I would take, two long runs, two speed days, two double runs and then medium-long runs that were 11-14 miles. I was focused on pushing volume, keeping up with speed work and building strength. All of the running training was typical, but what became just as important was nutrition and recovery. I drank a can of Beet Performer every single day. I event brought 11 cans of Beet Performer to Antarctica. It really makes a difference in stamina and endurance. For recovery I had a massage once a week. I also meditated every single night, focusing on positive affirmations and visualization. 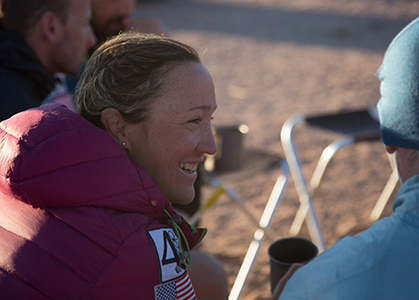 Mariah relaxes at camp after a full day of racing in the Atacama. Photo by Scott Manthey. I would wake up at 5:20 a.m. each morning, creep out of my tent, eat oatmeal with protein powder and drink coffee. I would sit by the fire and visualize a successful day coming. I made sure I was done eating by 6 a.m. to snuggle back into my sleeping back and rest for 45 more minutes. At 6:45 a.m. I went into go-mode. I’d slather on sunscreen, prepare my [food and water], get dressed and pack up before the course briefing began at 7:30 a.m.
Once finished for the day I could pass out, or if it was too hot I would blog on the cyber tent tablet. By 6 p.m. I would eat my dinner (most of the time mac and cheese) and by 7:30 p.m. I was back in bed for a [one-hour] stretching regimen. We’d typically fall asleep with the sun, making for early nights in Africa and late ones in China. In the 11 months [spent on all five races] I experienced a tight IT band, vomiting episodes, a sprained ankle, blisters under my toenails, swollen feet, sun burns and nausea. It is really wild what we endure out there. The most extreme day was in the Gobi March. It was 130 degrees that day, and we had to run 50 miles. At one point I actually ran out of water and imagined doing a face plant and dying. My shoes also melted and burnt my footpads, leaving me with serious blisters. It made for an excruciatingly painful final 10K two days later. The burns ultimately took seven months to fully heal. Then there was the dust storm that blew down camp and caused an evacuation of our last camp on the 50-mile day. I caught myself after each race saying it was for sure [the hardest] one, but looking back, The Last Desert was the most difficult for me. It absolutely stripped my energy. The other races took, on average, 30 hours, but due to the exhausting terrain out in the Last Desert, it took 40 hours to complete the 250K. The snow was so slushy that your whole body ached at night from being fatigued and swollen. I felt like multiple parts of my legs were on the brink of injury every day.